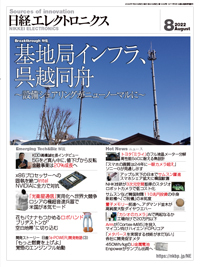 Nikkei Electronics is a comprehensive magazine covering electronics, information and communications technologies. It is by far the most trusted and valuable source of information for engineers and managers in Japan who are engaged in research, development and design at electronics manufacturers. The brand is so strong that 60.1% cited Nikkei Electronics in an independent survey asking to name one B2B magazine in the electronics field. News & Ranking' Section Special Rate.